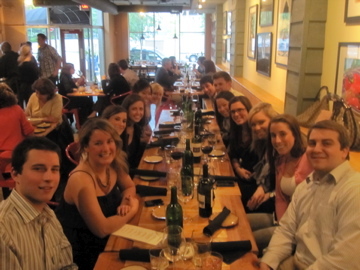 Last night I ate dinner at Mad Tomato Italian Kitchen in Clayton, MO. This brand new restaurant had its grand opening on May 10th and the philosophy is “Eat Fresh, Support Local, Provide for Others”. It’s not very big inside and the decor is a mix of modern and rustic with photos of the beautiful ingredients they use hanging on the walls. I loved it before I even sat down. Garlic + Basil + Arugula + Grana. This is what pizza should be. A light crispy crust, fresh ingredients tossed on, herbs picked straight from the stem, and olive oil drizzled on top. 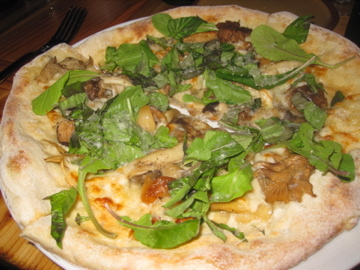 I tried the Fungi pizza first and loved the chewy mushrooms against the bitter arugula and roasted garlic. The pizza wasn’t too cheesy and the flavors really came through. 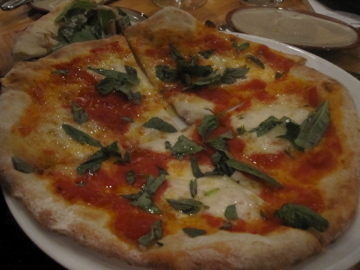 Next up was the Margherita which totally stole my heart. The homemade tomato sauce was lightly sweet just like you find in southern Italy. The mozzerella was fresh and was layered on in the perfect amount. And the basil on top completed the perfection. INCREDIBLE! 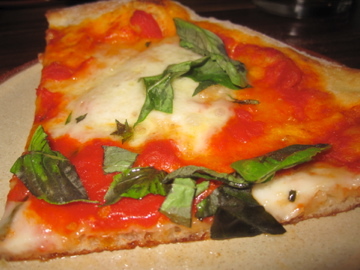 I ended up going back for another slice of the Margherita because it was just that good! Everyone else enjoyed their dishes as well and ordered things ranging from rabbit pasta to lamb meatballs to classic lasagna. The menu was really unique and varied due to the focus on local ingredients. 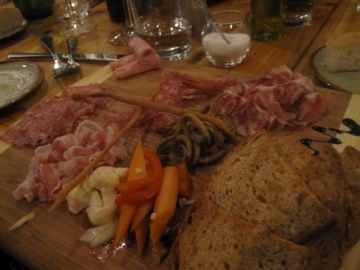 I really enjoyed Mad Tomato and would definitely recommend it as a place for a fresh take on classic Italian food. I can’t wait to go back and a hoping to take my family there soon! I’m getting ready to head up to Chicago for Memorial Day and won’t be back until Monday. I’m not bringing my computer so there won’t be much from me this weekend. Enjoy your time off and the unnofficial start of summer! Yum! Your pictures just sent me into the kitchen to start kneading an artisan crust! Sounds awesome! too funny…I was JUST reading in STL relish about the new restaurants in STL…this being one of them. Awesome to get a review..we’ll have to try this soon! ps. you still need to try Katie’s Pizza in Clayton. nom! So, thinking about it, I haven’t had pizza in a LONG time! That’s super sad, especially with how delicious the Fungi one looks! I think I’ll have to try my hand at another homemade one this week! I love fresh pizza. Trying new places is so much fun with friends because you can each order different things and have an inexpensive tasting. Those pizza pics just amped my craving for pizza 150%. Off to make one of my own that -sniff- won’t look or taste as good as those ones! They WOULD put the meat plate right in front of you!! 😉 Have an amazing time in Chicago, can’t wait to hear all about it when you get back!! I don’t think this is a bad idea but I do think there’s a better/less offensive way to phrase this. Hahaha I lol’ed at the “as well as some of the guys we run around with”. I know you didn’t mean it like that, but still funnnnnayyy. Wow. Baby girl, I am so sorry that commenter is totally attacking you for God knows what. I hate to throw names around, because I’m not like that, but anyone who comments mean remarks is a coward. I love you. You’re beautiful. And you don’t deserve that kind of treatment. Those look delicious. I want pizza…now. That place sounds so awesome. I wish there was a place near me that did local food in that way. 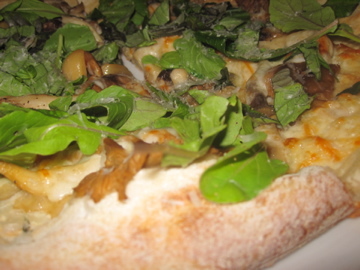 and the pizzas look delicious mushrooms on pizza are one of my fav toppings for sure. Hope you have a great time in Chicago! P.S. I’m not really sure what was going on but it sounds like someone was trying to crush your day 😦 Don’t let them, you are fabulous and I *love* reading your posts! have fun in chi-town lady! i lurv it there!! the marhgarita pizza looks amazing!! The pizza looks DELICIOUS! Have a safe & fun trip!!! Mmm. I’m a sucker for Italian food! 🙂 Hope you have a great weekend! That pizza looks delicious! We’ll have to see if we can swing by sometime when we’re up there in August 🙂 I bet Chicago is beautiful right now… it’s around 95 degrees in Florida right now… what I wouldn’t give for a Chicago summer!